Cauliflower is a funny thing. I never minded it as a kid (and Madison doesn’t either) but I have had plenty of kids at my dinner table turn the stuff down. I know, it’s kinda stinky, looks weird (sometimes all I can think of when I look at it is a boxers’ cauliflower ear. Gross!) and doesn’t cut, dice or slice neatly. And if its’ overcooked – whoa baby! Better clear out the kitchen. It’s in season here right now, and I’ve found myself craving it. Thought to have come originally from China, and thence to the Middle East, the Moors introduced cauliflower to Spain in the 12th century. It is a member of the cabbage family and, like all members of the cabbage family, suffers terribly if overcooked. A properly cooked cauliflower should have a pleasant fresh flavor, but if overcooked it will turn grey and become unpalatably soft, taking on a nasty rank flavor with an unpleasant aftertaste. All cauliflowers contain potassium, iron and zinc, but cooking reduces the amounts. They are also a good source of vitamins A and C.
Cauliflower should be a creamy white color with the outer leaves curled around the flower. The head should be unblemished without any discolored areas. Keep cauliflowers in a cool place for no longer than 1-2 days. I love it with some good hummus or lightly steamed. But rather than relegating it forever to the crudités plate or steaming it EVERYTIME I serve it, I’ve began experimenting with different ways to prepare it. One of my favorite and most simple ways to cook cauliflower it is to sauté it lightly with about a ½ cup of chopped yellow onion, olive oil and salt and pepper. It only needs to cook long enough for it to loose some of its’ firmness and I like to serve it with chicken or white fish. But when it comes to really doing something with cauliflower, I once again I bow at the Altar of Ina. Thanks to her I now do more than steam or sauté cauliflower. I now add cheese (lots of it!) and garlic to make it even tastier. I like the first recipe because I can assemble it earlier in the day and then pop it in the oven just before dinner. The second recipe is so easy it practically makes itself. Preheat the oven to 375 degrees. Cook the cauliflower florets in a large pot of boiling salted water for 5 to 6 minutes, until tender but still firm. Drain. Meanwhile, melt 2 tbsp of the butter in a medium saucepan over low heat. Add the flour, stirring constantly with a wooden spoon for 2 minutes. Pour the hot milk into the butter-flour mixture and stir until it comes to a boil. Boil, whisking constantly for 1 minute, or until thickened. Off the heat, add 1 tsp salt, the pepper, nutmeg and ½ cup Gruyere and the Parmesan cheeses. Pour one third of the sauce on the bottom of an 8x11x2-inch baking dish. 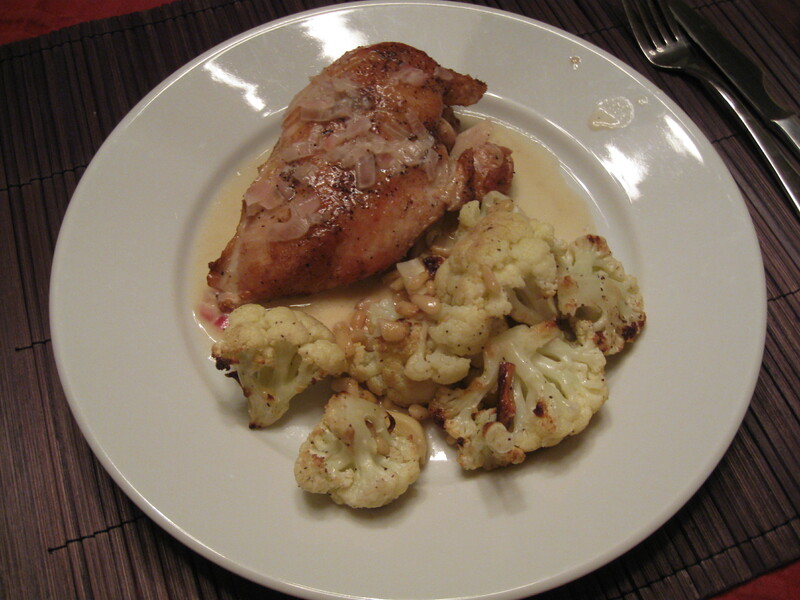 Place the drained cauliflower on top and then spread the rest of the sauce evenly on top. Combine the bread crumbs with the remaining ¼ cup Gruyere and sprinkle on top. Melt the remaining 2 tbsp of butter and drizzle over the gratin. Sprinkle with salt and pepper. Bake for 25 to 30 minutes, until the top is browned. Serve hot or at room temperature. Preheat the oven to 450 degrees. Bring a small pot of water to boil and add the garlic cloves. Boil for 15 seconds. Drain, peel and cut off any brown parts. Cut the largest cloves in half lengthwise. On a sheet pan lined with parchment paper, toss the cauliflower with the garlic, 3 tbsp olive oil, 2 tsp salt and 1 tsp pepper. Spread the mixture out in a single layer and roast for 20 to 25 minutes, tossing twice, until the cauliflower is tender and the garlic slightly browned. Scrape the cauliflower into a large bowl with the garlic and pan juices. Add the remaining 1 ½ tsp olive oil, parsley, pine nuts and lemon juice. Sprinkle with another ½ tsp salt, toss well and serve hot or warm. I have also had it served like a potato salad exchanging the potato with cauliflower. Yum! That sounds good too. Thanks for sharing.